Milk has been consumed by humans for thousands of years and was a valuable trade commodity. The size of ones herd was considered a measure of wealth. In fact often the rich rulers only entrusted the tending of the herds to their children. Let’s look at some reasons why raw milk is a complete and balanced food. Proteins: Raw milk contains proteins that provide resistance to many viruses, bacteria and bacterial toxins. It also, contains all 20 standard amino acids required for human health in a form ready to be used.Pasteurization destroys 20% of these proteins and changes the make up of the remaining proteins causing the body to have trouble in the processing of these proteins. Carbohydrates: Raw milk primary carbohydrate is Lactose. The enzyme lactase is contained in the milk which aids in the digestion of Lactose. Lactase is destroyed in pasteurization causing lactose intolerant people to have difficulty digesting the milk. I have friends that are lactose intolerant who have no problems when drinking raw milk. Fats: Over 66% of the fat in raw milk is saturated. Saturated fats needed by the body as they support stable cell membranes and are necessary for the production of key hormones. Processed pasteurized milk has most of these fats removed for use in other products. 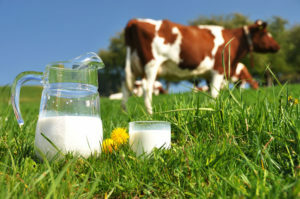 Enzymes: Raw milk contains over 60 beneficial enzymes for digestion, immune system support, and growth. Pasteurization destroys most of these enzymes. Vitamins: Raw milk contains vitamin A, vitamin D, niacin, riboflavin, thiamine, B6, B12, pantothenic acid, folic acid, Some of these are damaged or destroyed by pasteurization that is why the milk has to be fortified with vitamin A and D.
Bacteria: Raw milk is a living food that produces its own bacterial protection. This bacteria aids in immune system support of which 80% is contained in the human intestinal track. Wow did you know that a glass of raw milk could contain so much? Our Parents knew what they were saying when telling us to finish our milk because it is good for us. Now we just need to make sure we are drinking our “Raw Milk”. There have been case studies done to show that a person can survive and thrive by consuming only “Raw Milk”. People have tried living for 2 weeks only consuming raw milk, and their energy level was normal and they felt great. It helps to build muscles yes it is milk a complete food. When you work hard or exercise, Milk benefits to recover that lost energy and repairs the muscles. It is a great appetizer and a healthy snack. Add a glass of it to your dinner or drink it with a fruit. Women who drink skimmed or low fat milk lose more weight easily. At the end of the day, a glass of lukewarm milk benefits in reducing stress and relaxing the nerves. Lowers high blood pressure and, thus, reduces the risks of strokes. Reduces the production of cholesterol by the liver. One of important benefits of milk a complete food. It is great for improving the complextion. All you need to do is apply raw milk all over your face and neck and leave it for 10 minutes. Rinse off with fresh water. This will make your skin fairer and softer within minutes. You can also prepare a face pack by mixing 2 tbsp of it, 1 tbsp honey and 1 tbsp lemon juice. Apply this on clean skin and allow it to dry for ten minutes. This face pack acts as a mild bleach for your skin. Raw milk is an excellent cleanser. dip a cotton ball in It and wipe your face with it. Rinse off your face with fresh water after 5 minutes. Doing this daily will provide you with a squeaky clean skin from the inside out, besides making it fair and supple. Can also make a cleanser by blending 2 slices of papaya with it. Apply this mixture all over your face and neck and wash off with cold water after some time. This will make your face clean, fresh and fair. The combination of milk and honey works wonders on your skin. Mix 2 tbsp of powdered milk with 1 tbsp honey and 2 tbsp of warm water. Apply this all over your face and neck and allow it to dry. Rinse off with warm water after a while. Apart from this, the daily consumption of milk can beautify your skin naturally. It is loaded with vitamins, minerals and proteins that can make your skin fairer and radiant internally. For this prepare a facial and body scrub by mixing a cup of It with 3 tbsp of oatmeal. Apply it as a scrub on your face and body. Allow it to dry and then rinse off with warm water. Using this regularly will make your skin softer and smoother. Using it on your skin removes dead cells, thus giving a natural glow. For this dissolve some salt in boiling water and add 4 cups of instant non-fat milk to it. Soak for 20 minutes in lukewarm water and do the scrubbing. Make a smooth paste by mashing half a banana with a few tsp of raw milk. Apply it on clean and damp skin and leave it for 15 minutes. Wash off with water. This mask will help smoothen the fine lines and impart a natural glow as well. It is a great aid for sunburnt or sun tanned skin. Just apply some buttermilk directly on your skin to soothe and heal the sunburn. Milk benefits in keeping your skin moisturized throughout the day. You can take some raw, milk along with its cream. Dip a washed cloth in it such that it is fully saturated allow it to dry for about 5 to 15 minutes. Now scrub your face gently with the wash cloth for 3 to 5 minutes. This will restore the natural moisture of your skin, improve its elasticity and make it smooth and supple such that your skin looks fresh and glowing. It is a boon for dry and rough hair. Rubbing it on your scalp can nourish your hair from the inside out. Just apply some milk all over your scalp and wash off after a few minutes. This will make your hair naturally soft and silky. It can be a great conditioner for your hair. Just fill a spray bottle with some cold milk. Spray your hair thoroughly with this milk. Comb your hair gently and wash off after 30 minutes. You will not require a conditioner as the milk has already conditioned your hair. Using coconut milk on your hair makes it soft, shiny and manageable. Milk based products are also available that are meant for making your scalp healthy.